For the longest time, crocheters have envied knitters’ cabled creations. Guess what? Crocheters can make them, too! 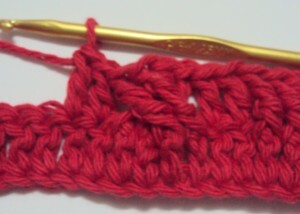 The cables are made by using front post stitches and back post stitches. 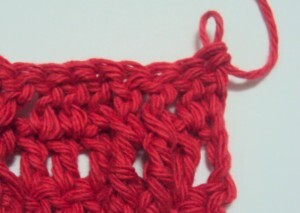 Different looks are achieved by crocheting around the stitches directly below the current row, or by making crossed stitches by skipping a few stitches first. The swatch on the right shows three different cables: the rightmost is the basic cable, the middle is the crossed cable, and the leftmost is made with a combination of the two. This tutorial shows you how to make all three kinds, and the pattern for the crocheted cable swatch is included at the end. For left handed pictures, roll your mouse over the image and it will change for you. Use the recommended hook size for the yarn you are using. If you use a hook too large, the cables won’t show as prominently; if you use a hook too small, you will find it more difficult to make stitches around posts. Crocheted cables pop out of the work more obviously when worked together with regular crochet stitches (and by “regular” I mean stitches made in the usual way, not around posts). 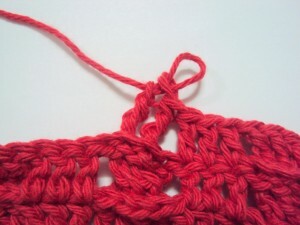 Remember to make the front post and back post stitches taller than the regular stitches, e.g. use hdc when you make fpdc and bpdc; use dc when you make fptr and bptr. Mix and match the different kinds of cables to make your own. 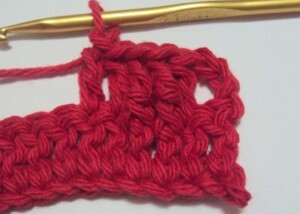 Vary the number of regular stitches in between cables. 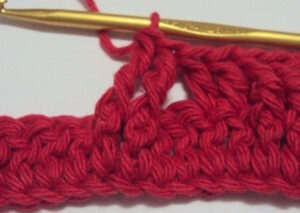 For this particular tutorial, we will use regular double crochet (dc) stitches and front post treble/triple crochet (fptr), and back post treble/triple crochet (bptr). 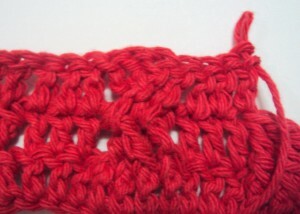 We start with a foundation of dc stitches, and begin working the cables on the second row. We start with 2 dc. The basic cable is made by making stitches around the post of the stitches directly below it. This shows 2 fptr made around the 2 dc directly below, and 2 dc after the cables. What happens when we have to turn the work though? 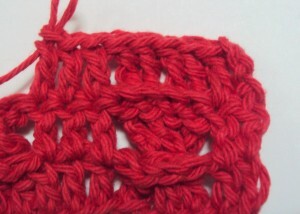 For the next row, we work the bptr stitches around the 2 fptr made from the previous row. This shows how the next row looks with 3 dc, 2 bptr, and 2 dc. This is the wrong side of the work. This shows the work from the right side. Continue working alternate fptr and bptr rows into the same stitches. Crossed cables are made by skipping a couple of stitches, making front post stitches, and then going back to make front post stitches around the skipped stitches. 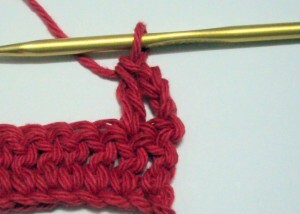 For this tutorial we are making crossed cables made over 4 stitches. Skip two dc, fptr in next stitch. Fptr in the first skipped stitch. Fptr in next stitch. Crossed cable made, with 2 dc at end. What to do when you turn the work? We repeat what we did in the first crossed cable row, but use bptr instead of fptr. Skip two stitches, bptr in next two stitches. This shows how the work from the right side looks. 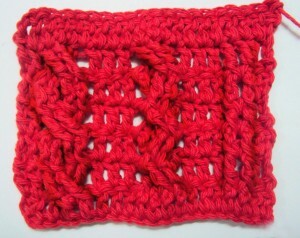 Continue working crossed cables by alternating fptr and bptr rows. 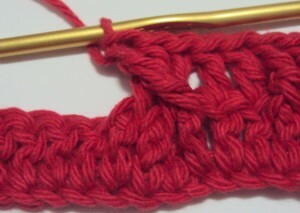 Now that we know how to make the basic and crossed cables, we combine the two to make different cable patterns. 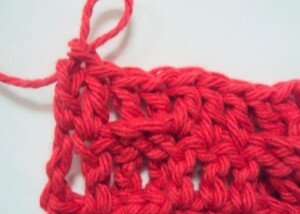 The one made in the tutorial is made with alternating crossed and basic cables. We start with crossed cables after the foundation row. Skip 2 stitches, fptr in next 2 stitches. Now we make a set of basic cables using bptr. Bptr in each of 4 fptr of previous row. Remember that this is the wrong side of the work. This is how the two cable rows look like from the right side. Repeat the two cable rows, working crossed cables in fptr and basic cables in bptr. 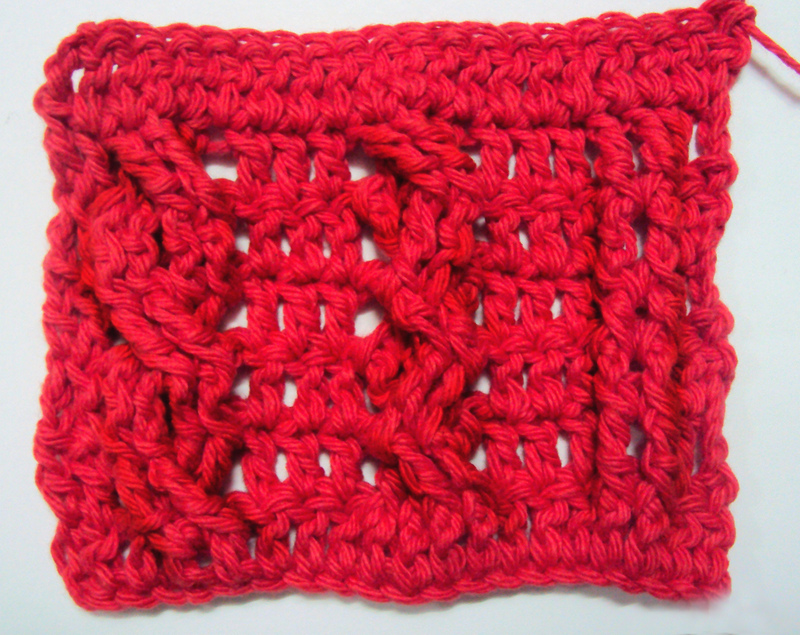 Crochet Spot has a few patterns you can use to practice your newly acquired cable-y skills. Erin’s Cabled Headband Crochet Pattern makes a pretty and quick project. You can also try Rachel’s cute and functional Reversible Wrist Warmers Crochet Pattern. Rows 4-6: Repeat rows 2 and 3 once. Repeat row 2. Let me know what you think! If you need any help just let me know by leaving a comment below. This entry was posted on Friday, December 17th, 2010 at 12:35 AM by Claire Ortega-Reyes	and is filed under Tutorials and Help. You can follow any responses to this entry through the RSS 2.0 feed. You can leave a response, or trackback from your own site. I was actually gonna ask if you could teach us how to do cable stitch so thank you:) I love this site. Thank you so much, Claire, for this post. I had been working on a cabled afghan and was frustrated by the holes that pulled to the side of the cables. I put it aside thinking I was doing something wrong. I see from your photos that it is normal to have larger spaces running along side the cables. Now I can finish my afghan with confidence. I made a pair of hand-warmers with a similar cable pattern. These things were TOUGH. and I still am not as satisfied with them as I could be. Knit cables, in my opinion, look better. 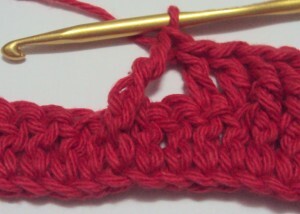 I used a simple worsted weight yarn (Vanna brand). How do the cables look in bluky or fingerling? WOW thank you so much for the clear instructions on this! Thanks for the clear instructions and pictures! This tutorial is GREAT!! Why do i only get 19 sts in the second row? I got 20 sts in the first row and im following the pattern to a t and still only 19 sts.. i’ve been going back but everytime only 19 sts..
Of coarse! I should’ve seen that thank you very much!! I love this pattern now that i get it ! Hi Barbara, I think it wants to make sure the loops (created from chain 8 on the previous row) appear on the other side of the work. 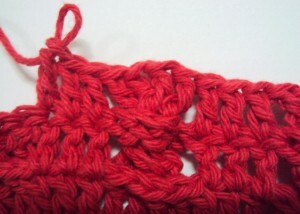 So you will make a sc in each of the sc stitches across the row, omitting the chains loops. 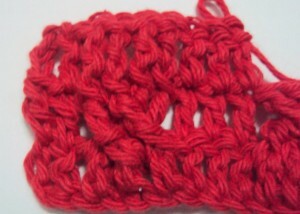 The loops will then dangle of the other side of the row. I’m assuming the chain loops will be used later to create the braid.